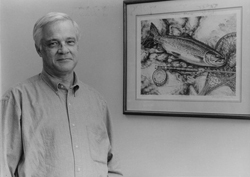 When I entered the Ph.D. program in Physiology & Biophysics (“PBio”) at the University of Washington in 1995, the department chair was a physician-scientist named Wayne Crill. (1) He looked and spoke a bit like The Godfather. (2) He was supportive of various grad student initiatives, such as our push for a department-sponsored Career Day and our proposal to determine our own representation on faculty committees. “We really treasure our graduate students” — what a sentence! So concise, yet so unabashedly heartfelt! At a memorial gathering last Wednesday, Wayne’s friends and family shared additional memories. Colleague Mike Shadlen recalled that Wayne would often introduce new topics with the phrase, “As you may or may not know…” — a phrase described by Mike as “so empty and tautological,” yet followed by incisive and fair-minded summaries of difficult issues. And then there was the sign in the Wordeman lab: “WWWD?” What Would Wayne Do? I was unaware of these things until they were mentioned at the memorial, but one other tribute did spur a flash of recognition. I am here totally by accident. My path was governed by Brownian motion with a nudge from common sense. This is probably incomprehensible to most people who plan their lives in great detail. I was just lucky that I ended up doing exactly what I wanted to do. It’s hard to imagine a much better epitaph than that.